The Isma‘ili Muslims take their name from the fact that they affirm the Imamat of Mawlana Isma‘il ibn Ja‘far as the hereditary Imām after the Imām Ja‘far al-Ṣādiq – as opposed to the Twelvers who believe that Musa al-Kāẓim was the Imām after Imām al-Sadiq. The issue became complicated because most historical sources confirm that the Imam Ja‘far al-Sadiq publically designated his son Isma‘il as his successor. But most sources also say that Ismā‘īl died before his father. Therefore, at the death of the Imam Ja‘far al-Ṣādiq, the Shi‘ah community split into a number of factions – each following a different Imam. Many who followed Isma‘il and upheld his Imamat did not believe that Ismā‘īl had actually died, while others affirmed Isma‘il’s death and followed his son Muhammad ib. Ismā‘īl as the Imam. 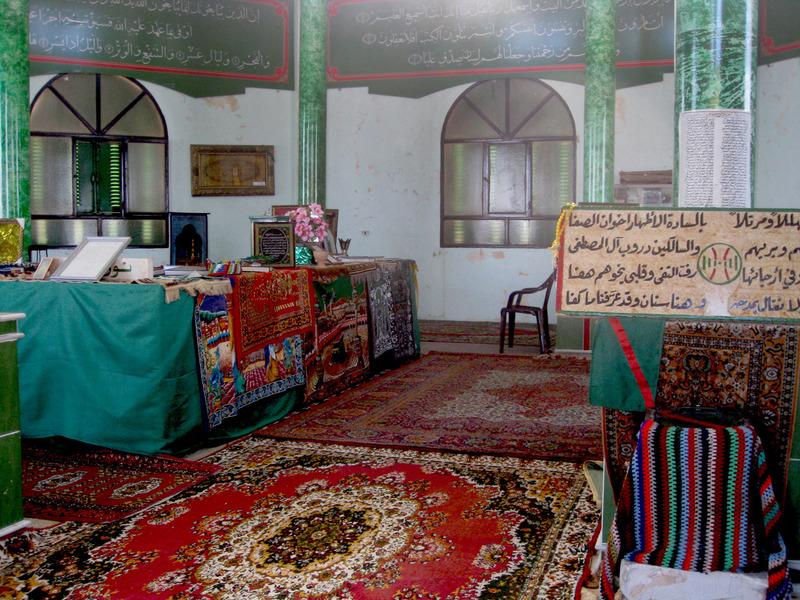 The group of Shi‘ah known as the Isma‘ilis trace the line of Imamat through the direct descendants of Isma‘il ibn Ja‘far and his son Muhammad ibn Isma‘il and today recognize their lineal descendant, Imam Shah Karim al-Husayni Aga Khan IV, as the Present, Living and Manifest Imam of Shi‘i Islam. In the case of the Shia Muslims, the Shia branch of Islam split and one branch of the Shia Muslims accepted the concept of the Imam in hiding, the invisible Imam, because the twelfth Imam disappeared as a very young child, and our branch of Shia Islam, in that particular generation of the family, accepted the legitimacy of the eldest son, Isma‘il, as being the appointed Imam to succeed and that is why they are known as Ismailis. And that branch of the family has continued today hereditarily and that is why there is a living Imam for the Ismaili Muslims. The question of who was the rightful successor to the Imam Ja‘far al-Sadiq is of extreme importance. This is because the Imam Ja‘far al-Sadiq was the last Imam recognized by both Isma‘ili and Twelver Shi‘is. The Imam Ja‘far is also revered by Sunni Muslims as one of the great scholars of hadith as he narrates at least 2000 traditions which are found in the nine major books of Sunni hadith, with 110 of these found within the six canonical collections (Sihah al-Sitta). He was the teacher of four founders of Islamic schools of thought: Mālik ibn Anas (d. 795), Abū Ḥanīfa al-Nu‘mān (d. 767), Sufyān al-Thawrī (d. 778), and ‘Abd al-Raḥmān al-Awzā‘ī (d. 774). In addition, the ḥadīth scholars and jurists Ibn Jurayj (d. 767), Sufyān ibn ‘Uyayna (d. 815) and Shu’ba ibn al-Ḥajjāj (d. 776) also studied under him. He was descended of Imam Ali b. Abi Talib through his father and Abu Bakr from his mother’s side. The overwhelming majority of Sufi chains of lineage go through him. It was during his time that many central theological doctrines of Shi’ism began to crystallize. He has been designated “Shaykh al-‘Ulamā’” and “Imām al-Fuqahā’” for his noble rank as one of the most knowledgeable men that the Islamic world has ever seen. (Source: Ballandalus). For Shi‘i and Sufi Muslims, the true successor of the Imam Ja‘far al-Sadiq is the inheritor of his authority, knowledge, and spiritual legacy; and the true lineage of Imamat continues the spiritual virtues, mystical teachings and authoritative knowledge of Imam Ja‘far al-Sadiq. This article presents a series of Seven Proofs that the Imāmah after Imām Ja‘far al-Ṣādiq went to his son Isma‘il and the Isma‘ili Imams from his lineal descendants. Below is a summary of the proofs. Please read beyond for the evidence for each, or click on the proof number, to jump directly to a specific proof. Taken individually or collectively, these Seven Proofs demonstrate that the legitimate successor and true Imam after the Imam Ja‘far al-Sadiq is Mawlānā Ismā‘īl ibn Ja‘far and that the Present and Living Imam of all Shi‘i Muslims must be the direct lineal descendant of Isma‘il ibn Ja‘far. Proof #1: Imām Ja‘far designated Mawlānā Ismā‘īl as the next Imam by the rule of nass as per Twelver, Ismaili, Sunni and academic sources. Proof #2: The only way to deny the nass of Mawlānā Isma‘il is through contradictory hadiths presented in later Twelver hadith books. Proof #3: Isma‘il’s death before Imam Ja‘far is not confirmed and may have been staged to protect him — as he was reportedly seen by eyewitnesses after his alleged death. Proof #4: Even if Isma‘il had died before his father, the Imamat continued in Isma‘il’s son, Muhammad ibn Isma‘il, whom Isma‘il had appointed as his own successor. Proof #5: Earliest Shi‘i hadiths lack the mention of Twelve Imams but instead predict exactly the first eighteen Imams in the Isma‘ili lineage of Imamat. Proof #6: With the exception of the Nizari Ismaili Imamat, all other Shi‘i Imamat lineages have hidden Imams. This contradicts the Qur’anic definition of Imamat which requires the Imam always be present and manifest (mubin) in the world. Proof #7: Imam Shah Karim al-Husayni Aga Khan IV is the forty-ninth hereditary Imam of Shi‘i Islam in direct, documented, lineal descent from Mawlana Isma‘il ibn Ja‘far al-Sadiq. As the only present (hadir), manifest (mubin) and living (mawjud) hereditary Imam, with a documented and validated lineage, Imam Shah Karim al-Husayni’s very existence is itself confirmation of his Imamat and that of his ancestors. Every Imām designates the succeeding Imām from among his descendants and this designation is called naṣṣ. The identity of the next Imām is determined by the Command of God and disclosed by the Imām of the Time. [The Imam Muhammad] Al-Bāqir, as noted, categorically maintained that that, contrary to the belief of some groups, the Imām had to be divinely appointed and that his appointment had to be clear and precise, i.e. by naṣṣ al-jalī (explicit designation). The Imām knows the one who will be the Imām after him, and so he passes his inheritance on to him. Ja‘far ibn Muhammad designated (ashāra ila) the Imamat of his son Isma‘il ibn Ja‘far. And when the Command of God came to him [Imam Ja‘far] to hand over [his high office], he summoned his dignitaries and specially deserving followers, just as it was done by other Imams and Prophets before him, and handed over his authority to his son Isma‘il, by the Command of God and His inspiration of him, making them witnesses of this, his appointment. Thus, Isma‘il became the Gate to God (bab Allah) and His prayer niche (mihrab), the repository of His Light, the link between Him and His creatures – both we and you admit this. And then his body was caused to disappear during the lifetime of his father, as a mystery, intended to protect him from his enemies, and as a test for his followers. It is similarly narrated from Ja‘far as-Sadiq that he said: ‘Even if someone should come before you with the head of this, my son [Isma‘il], do not doubt, nevertheless, that he is to be the Imam after me.’ And on another occasion he said, while he, Isma‘il ibn Ja‘far, was present: ‘He is the Imam after me, and what you learn from him is just the same as if you have learnt it from myself. We narrate [the tradition] (rawayna) and you narrate [the tradition] (rawaytum) that when [Isma‘il] the son of the Imam [Ja‘far] completed seven years of age, the Master (sahib) of the Time (waqt) declared him (‘arafa-hu) the Master of Religion (sahib al-din) and his heir apparent among sons. And he guarded him from his other of his sons, kept him away from the contact with the public, and his education went on under his own supervision. These hold that Ismā‘il was the designated Imām after Ja‘far, as the sons of Ja’far also agreed. As far as Isma‘il ibn Ja’far as-Sadiq, he was given the patronym of Abu Muhammad, and his mother was Fatimah bint al-Husayn al-Athram bin al-Hasan bin Ali ibn Abi Talib, and was known as Al-‘Araj. He was the eldest son of his father, and the most beloved by him; his father loved him intensely. According to the overwhelming majority of the available sources, both sectarian and of their opponents, Imam Ja‘far appointed as his successor his eldest son Isma‘il, by his first wife, a highly aristocratic lady, great grand-daughter of Hasan. Our oldest and presumably most reliable authorities agree that Ja‘far designated his second son Isma‘il to succeed him as Imam. The trial case for the Shi‘a in all periods that were to follow was that of the Imam Ja‘far al-Sadiq who, by most reports, publicly designated his second son Isma‘il as the person to succeed him. This fact was accepted as the formal act of nass required by Shiite theory and was therefore a designation by an infallible imam of the new Imam who would inherit the full powers of the imamate. Isma‘il was thus not only Ja‘far’s choice but was God’s choice as well. However, to the extreme chagrin of Ja‘far’s numerous, deeply committed followers, Isma‘il died before his father. That Ja‘far’s choice of Isma‘il had been a mistake could not be admitted by his Shi‘a under any circumstances, although as long as the father lived there was hope of an explanation and a correction to this perception of error. Apparently, though, Ja‘far did not appoint another in place of Isma‘il and the theoretical argument by which he might have done so is, generally speaking, missing. Imami writers like al-Nawbakhti admitted as much even a hundred years after the fact… Those who formed the main party of what became the Ismailis refused either of these possibilities and claimed instead that the designation of Isma‘il was not only sound, no matter the early death of Isma‘il, but, because Ja‘far’s choice was correct, the succession necessarily moved thereafter beyond Isma‘il to his own son Muhammad. According to the majority of the available sources, he [Imām Ja‘far] had designated his second son Ismā‘īl (the eponym of the Isma‘ıliyya) as his successor, by the rule of the naṣṣ. There can be no doubt about the authenticity of this designation, which forms the basis of the claims of the Ismā‘īlīyya and which should have settled the question of al Ṣādiq’s succession in due. There seems to be general agreement among the Shi‘i sources that, at first, as-Sadiq had intended his eldest son Ismā‘īl to succeed him. “Abū ‘Abdullāh [Imām al-Ṣādiq] had ten children… Ismā‘īl was the eldest of them. Abū ‘Abdullāh [Imām al-Ṣādiq] had intense love, affection, and devotion for him, and the people believed that he would be the rectifier [al-qā’im] after him, and that he would be his successor. This was because he was the eldest of the brothers, as well as his father’s intense inclination towards him, and the great nobility which his father bestowed upon him. It appears that most of the followers of as-Ṣādiq were expecting the latter’s eldest son, Ismā‘īl, whose mother was a granddaughter of Zaynu’l-‘Ābidīn, the Fourth Imām, to succeed to the Imamate. Apparently, though, Ja‘far did not appoint another in place of Isma‘il and the theoretical argument by which he might have done so is, generally speaking, missing. Imami writers like al-Nawbakhti admitted as much even a hundred years after the fact. However, the fact remains that Isma‘il was not present at the time of the Imam al-Sadiq’s death, when three other sons simultaneously claimed his succession, though none of them could convincingly prove to have been the beneficiary of a second nass. As a result, the Imam al-Sadiq’s Shı‘ı partisans split into six groups, two of which constituted the nucleus of the nascent Isma‘iliyya. After Abu ‘Abdullāh [Imām al-Ṣādiq] died, some of the people believed that the Imāmah had passed to ‘Abd Allāh the son of Ja‘far, and they disagreed. And others said that it had passed to Abū’l-Ḥasan [Mūsa al-Kāẓim], and so Zurarah called for his son ‘Ubayd, and said: “O my son, the people are disagreeing about this affair. Those who are supporting ‘Abd Allāh are basing themselves on the report that says that Imāmah goes to the eldest son of the Imam. Get your riding camel and go to Madinah until you can bring me the truth about this affair.” Zurarah eventually became very ill, and when death approached he asked about ‘Ubayd. It was said to him: ‘He has not come.’ And so Zurarah called for a Qur’ān, and said: ‘O Allāh, indeed I bear witness to what has come with Your prophet Muḥammad and what You have revealed to him and made clear to us through his tongue, and I bear witness to what You have sent down in this Book. Indeed, my covenant and my religion is what my son ‘Ubayd will bring, and what You have explained in Your Book. If you will end my life before he comes, then this is my testimony and confession upon my own self concerning what ‘Ubayd, my son, will say. And You are my witness for that.’ And so Zurarah died. When his son Abu Ja‘far [Muhammad] died, I was beside Abu al-Hasan [Ali al-Hadi]. I was thinking that Abu Ja‘far and Abu Muhammad [Hasan al-Askari] are like Musa ibn Ja‘far and Isma‘il ibn Ja‘far in this age; their story is the same. Just when I was about to say that Abu Muhammad was expected after Abu Ja‘far, Abu al-Hasan [‘Ali al-Hadi] turned to me and said: “Yes, Abu Hashim. The unknown thing concerning Abu Muhammad [coming] after Abu Ja‘far became clear for God (badā’ li-Allāh). His situation is that of Musa, i.e. badā occurred after Isma‘il’s death. Abu Muhammad [Hasan al-‘Askari] will be my successor. The above hadith in Twelver books shows that even during the lifetime of the tenth Twelver Imam, the Twelver community – irrespective of the questionable idea of badā’ [to be dealt with below] – had expected that Isma‘il was going to be the Imam succeeding Imam Ja‘far al-Sadiq. The fact that the case of Isma‘il was cited by the tenth Twelver Imam to justify his own second designation, confirms the Twelver Imams knew Isma’il was the designated successor for the Imamah. To negate Mawlānā Ismā‘īl’s nass (shown in Proof #1), Twelver hadiths attributed to the Imām Ja‘far, as reported by scholar Shaykh al-Saduq [d. 991], state God was unaware that Isma‘il would die and so “changed His Mind” and appointed another successor in Ismā‘īl’s place. To assert God was ignorant is a fallacy and contradiction since, by definition, God knows all. Imam Ja‘far (allegedly) said: “No new affair (badā’) appeared to God (badā li-llāh) like what appeared to Him (badā’ lahu) about my son Ismā‘īl since he was slain before me, in order that it would be known that he was not the Imam after me. It [the badā’ doctrine] implied God’s change of mind because of a new consideration, caused by the death of Ismail. However, such connotations in the doctrine of badā’ (change of mind) raised serious questions about the nature of God’s knowledge, and indirectly, about the ability of the Imams to prophesy future occurrences… Ibn Babuya cites a tradition in which the sixth Imam, al-Sadiq, says: “He who asserts that God, the Mighty and Glorious, does something new which He did not know before, – from him I disassociate myself,” and then he added, “He who asserts that God, after doing something, repents concerning it, – then he, in our opinion, is a denier of God, the Almighty.” But the question of the change concerning the Imamat from Isma‘il to Musa al-Kazim, the sons of al-Sadiq, remained unsettled. If someone claims that something manifests itself to Allah one day which He did not know the previous day, then disassociate from that person. ‘Ali ibn Mahziyar says: ‘I said to Abū Al-Ḥasan [the tenth Twelver Imām]: "If something should happen, and I take refuge in Allah from that, then who will it go to?" He said: "It will go to my eldest son." بدا لله في أبي محمد بعد أبي جعفر ما لم يكون يُعرَف له كما بدا له في موسى بعد مضي إسماعيل. Something has become manifested to Allah [badā li-Llāh] in Abu Muhammad [al-‘Askari] after Abu Ja’far [Muhammad] something which was not known to Him before, just as something became manifest to Him (badā lahu) about Mūsā [al-Kāẓim] after the death of Ismā‘īl. Again, how can the death of any person be newly known to God (badā li-Llāh)? God, by definition, always has complete knowledge of all things. It is self-evident that hadiths which theologically contradictory and question the omniscience of God cannot be genuine and thus can not be used to justify the Imamat of Mūsa and al-‘Askarī. Another argument used to try and nullify Mawlānā Ismā‘īl’s designation are contradictory hadīths where the Imām Ja‘far pleads with God for Isma‘il to be the Imam after him but God refuses his requests. Imam al-Sadiq said: I have not ceased imploring Allah the Exalted about Ismā‘īl, begging him to bring him back to life and make him the Rectifier (qā’im) after me, but my Lord has refused this. This is not something that a man places wherever he wants; rather it is a covenant from Allah the Exalted and Glorified. He will make this covenant with whomever he wills, and so Allah has willed that my son Mūsā would be the Rectifier after me, and has refused to make Ismā‘īl the Imam after me. Imam as-Sadiq said: “Nothing has been manifested to Allah greater than what was manifested to him about my son, Ismā‘īl. I implored Allah that he make Ismā‘īl the Imam after me, but he refused to make anyone the Imam except my son Mūsā. إنّي سألت اللّه في إسماعيل أن يُبقيه بعدي فأبى، ولكنّه قد أعطاني فيه منزلة أُخرى، انّه يكون أوّل منشور في عشرة من أصحابه،. Imam as-Sadiq said: “I asked Allah that he would preserve Ismā‘īl after me, but He refused. But He has given me another noble station with him; indeed, he will be the first to be risen [at the End of Time] amongst his companions. So was Allah pleading with himself? The whole idea that the Imam would desire something other than what God desires, and implore God to grant him his desire, is absurd and contradicts the very definition of Imāmah because the Imām, by definition, is the khalīfah or representative of God on earth and is divinely inspired (mu’ayyad) by the Holy Spirit (Ruh al-Quds). Whatever the Imam desires on a religious or spiritual matter is a reflection of God’s Will and can never go against the Will of God. Therefore, given the contradictions with the very definition of Imamat in the above hadiths, it is self-evident that they — like others upon which the Twelvers rely on to refute the Imāmah of Mawlānā Ismā‘īl, such as those that state God was ignorant of Ismā‘īl’s death until it happened, as discussed earlier — cannot be genuine. Another argument in Twelver texts relies on hadiths purportedly attributed to Imām Ja‘far that contradict all of the historical evidence in Proof 1 — that Imam Ja‘far appointed his son Ismā‘īl as the Imam via nass — and, instead, claim that Imām Ja‘far actually condemned his beloved son Mawlānā Ismā‘īl as a sinner! Such reports about Isma‘il’s dipsomania and his disavowal by his father, especially as related by the Twelver sources, probably represent later fabrications by those who did not accept the Isma‘ili line of imams. 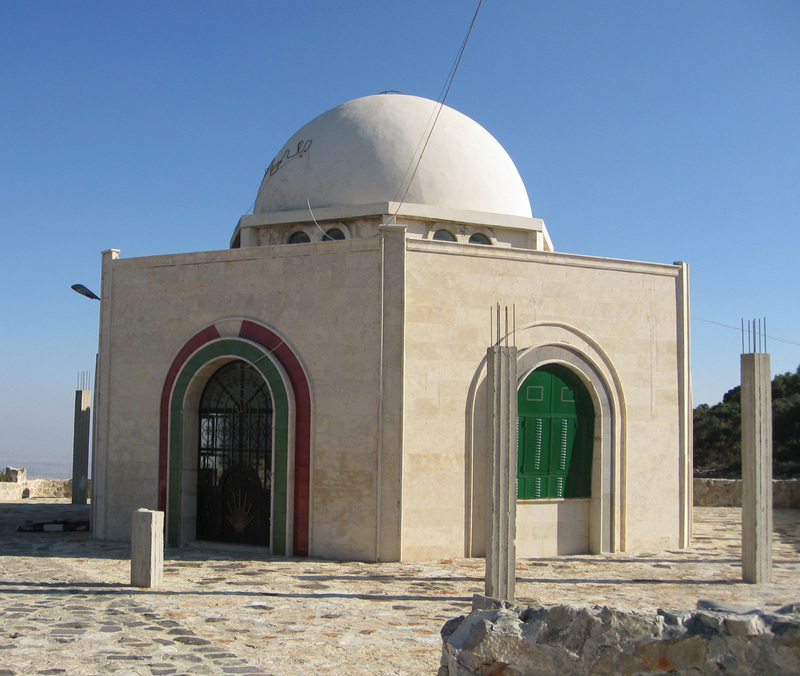 Maqam al-Imam, Salamiyyah, Syria. 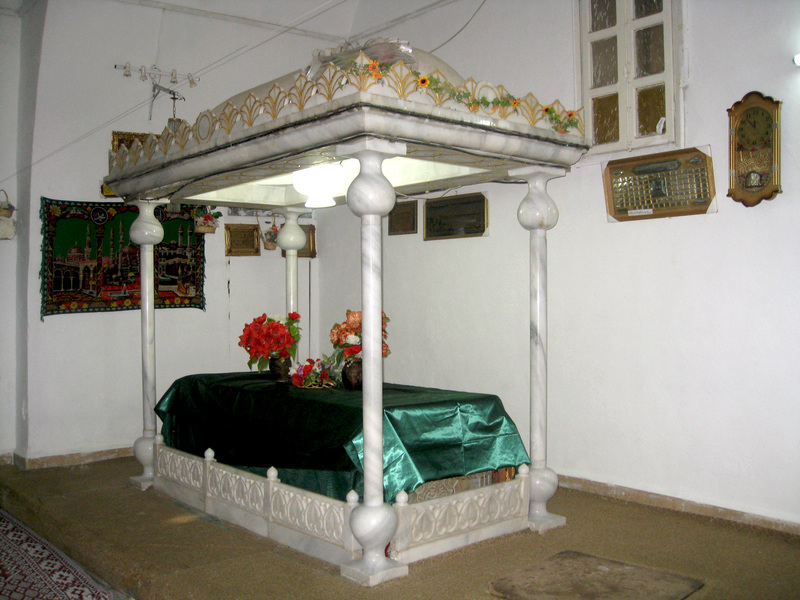 It is believed to contain the tomb of Imam Isma’il ibn Ja’. After Muhammad ibn Isma’il, the Isma’ili Imams directed the Isma’ili da’wah from Salamiyyah until the establishment of the Fatimid Caliiphate in 909. 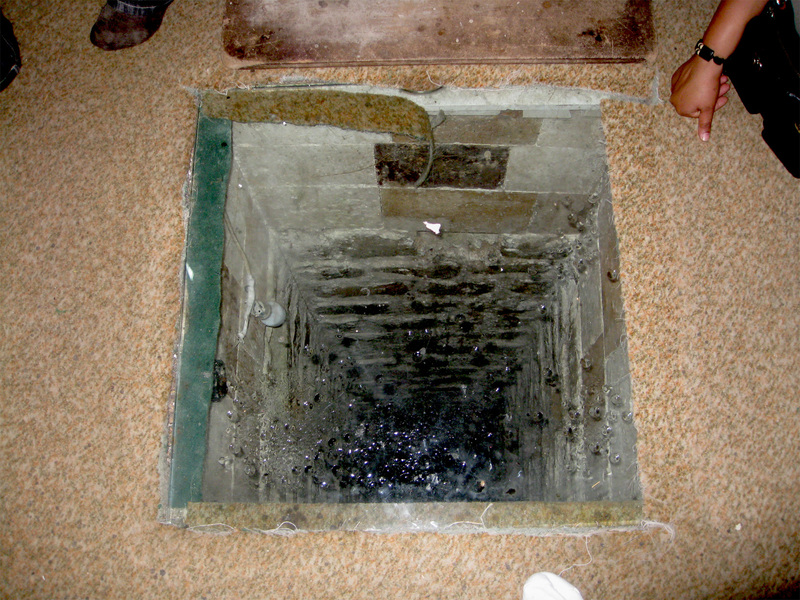 This is believed to be the secret underground tunnel in Maqam al-Imam used by the Isma’ili Imams and their da’is to escape ‘Abbasid persecution. The exact date and the circumstances of Isma‘il’s death also remain unknown. According to some Isma‘ili authors, Isma‘il survived the Imam al-Sadiq. 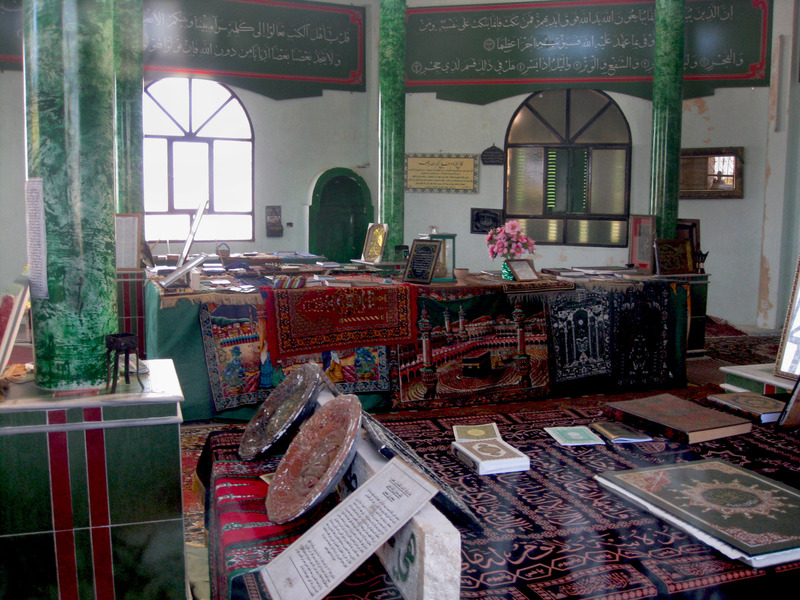 However, the majority of sources report that he predeceased his father in Medina, and was buried in the Baqı cemetery… Many Isma‘ili and non-Isma‘ili sources repeat the story of how, before and during Isma‘il’s funeral procession, the Imam al-Sadiq made deliberate attempts to show the face of his dead son to witnesses, though some of the same sources also relate reports indicating that Isma‘il was seen in Basra soon afterwards. The question of the successor to the Imam (Jafar al-Sadiq) having been made particularly difficult by the fact that the Abbasid caliph al-Mansur had decided to scourge to death whoever was to be chosen officially by the Imam as his successor thereby hoping to put an end to the Shiite movement. The following extensive report, by Ja‘far ibn Mansur al-Yaman (d. 960), is among the earlier sources that cover Ismail’s purported death and funeral. In this account, the Imam Ja‘far al-Sadiq takes unusual measures to have numerous people watch the funeral of Isma‘il and testify that Isma‘il has died. This is done in order to convince the ‘Abbasid Caliph that the successor of Imam Ja‘far has died and thus spare Isma‘il from ‘Abbasid persecution. A few days later, Isma‘il was seen alive in Basra and this was reported to the ‘Abbasid Caliph. However, the Imam Ja‘far was able to produce witnesses that Isma‘il has died and he was saved from harm. And also among those things which prove the Imamat of Isma‘il b. Ja‘far is the fact that when he died, Ja‘far left his body remain covered in his house for three days. His face was left uncovered, and the people who came in could recognize him – the Hashimites and the non-Hashimites, the residents of Madina, and the visitors from elsewhere. Imam Ja‘far himself asked those who came to express their condolence to him: “Is not this my son Isma‘il?” And those who saw him had no choice but to admit this without hesitation. Then he took the signature of the visitor, as to what he had seen. He did this until in Madina all the Hashimites, local people and visitors, had given their signatures. The body was then taken out to the Baqi cemetery on the fourth day, still with the face exposed. From time to time the Imam [Ja‘far] caused it to be laid on the ground, kissed it, and said: “By God, the death of Isma‘il does not hurt me so much as what I have promised him.” He made the whole crowd which was with him to witness his burial, and even took signatures from those who were not present before the body was carried about. He did this three times, and on the fourth he had the body placed in the grave. He went through the ceremony in the usual way, and those present could give testimony of having seen him [Isma‘il] buried in their presence. The local spies wrote about all this to al-Mansur [the second ‘Abbasid Caliph]. And Imam Ja‘far also sent a letter to him, informing him of his bereavement. The ‘Abbasids [had] sent spies to watch Imam Ja‘far, in order to find out who was appointed as his successor, so that he might be murdered. When the news [about the appointment of Isma‘il] came to him, he became worried. And they [the spies] were watching Isma‘il, plotting to seize him. Then came the news of his death, and the Caliph was relieved from his anxiety. Thus the spies of the caliph wrote about Isma‘il being dead, and also Ja‘far al-Sadiq wrote about his bereavement. And when the caliph read the latest news, he said: ‘Verily, the trickery of the sons Abu Kabsha will never cease until they perish to the last man.’ Then he immediately summoned Imam Ja‘far, who was brought before him. When he appeared before the caliph, the latter produced his own letter, and the report of the spies, and, showing to Imam Ja‘far his own note, asked him: ‘Is not this in their own handwriting, the letter informing me about Isma‘il’s death?’ The Imam replied: ‘yes’. Then the caliph produced the report of his spies about the events which took place in Basra. The Imam also produced the testimony of those who witnessed the death and the burial of his son. When the caliph saw these documents, his anger subsided. He then summoned a number of the Hashimites who were with him, and they testified what they had seen, and acknowledged their signatures. إن شيطانا قد ولع بابني إسماعيل يتصور في صورته ليفتن به الناس وإنه لا يتصور في صورة نبي ولا وصي نبي ، فمن قال لك من الناس: إن إسماعيل ابني حي لم يمت ، فإنما ذلك الشيطان تمثل له في صورة إسماعيل ، مازلت ابتهل إلى الله في إسماعيل ابني أن يحييه لي ويكون القيم من بعدي فأبى ربي ذلك و إن هذا شيء ليس إلى الجرل منا يضعه حيث يشاء إنما ذلك عهد من الله عز و جل يعهده إلى من يشاء فشاء الله أن يكون إبني موسى أبي أن يكون إسماعيل. Indeed, Satan has become passionately fond of my son Isma‘il, and has appeared in his image in order to create chaos amongst the people. But he cannot take the form of a prophet, nor the successor of a prophet. And so whenever the people say that my son Isma‘il is alive and has not died, then this is nothing but Satan, manifesting himself in Isma‘il’s form. Of course, the existence of the above hadiths in Twelver books raised the question of why they are there in the first place. Two possibilities present themselves: a) either Imam Isma‘il was seen after his alleged death — because he was actually alive — and his father Imam al-Sadiq actually made these statements; or b) these hadith are not genuine. If they are genuine, then it would be logical to conclude the Imam made such statements under practicing taqiyya — so as to continue to protect his son’s life, after the meticulously staged death and funeral he arranged for that very purpose. Muhammad was the eldest son of Isma‘il who had at least one other son named ‘Ali. He was also the eldest grandson of the Imam al-Sadiq and, according to Isma‘ili tradition, was twenty-six years old at the time of the latter’s death. Furthermore, all sources agree that he was older than his uncle Musa by about eight years… He was the imam of the Mubarakiyya and the eldest male member of the Imam al-Sadiq’s family, after the death of his uncle ‘Abd Allah al-Aftah. As such, he enjoyed a certain degree of esteem and seniority in this Fatimid branch of the ‘Alid family… It was probably then, not long after al-Sadiq’s death, that Muhammad left Medina for the east and went into hiding, henceforth acquiring the epithet al- Maktum, the Hidden. As a result, he was saved from persecution by the Abbasids, while continuing to maintain close contacts with the Mubarakiyya, who like most other radical Shi‘i groups of the time were centred in Kufa. Different sources mention various localities and regions as Muhammad’s final destination, but it is certain that he first went to southern Iraq and then to Persia. It is evident that Isma‘il was not present in Medina when his father died, but that he had designated his successor… A second group of the Shi‘i Imamis affirmed Isma‘il’s death had occurred in the lifetime of his father and now recognized his eldest son Muhammad b. Isma‘il as their Imam. Isma‘il never left this world without leaving in his stead his son, who was of mature age, and that the Imamat had been handed over to him by the Command of God, and His inspiration of him. And that he, Isma‘il b. Ja‘far, when the desire of God became known to him, received an inspiration to hand over the authority to his son Muhammad. He then summoned the dignitaries, and those specially trusted amongst his followers, and handed it over to him in the presence of the chosen ones alone, in secret, in order not to expose him to danger…He, Muhammad b. Isma‘il, was at that time a grown up, 14 years of age. At such age witness is acceptable from a man, according to law. He [Imam Isma‘il] did this in anticipation of the calamities and the attack of the infidels which were to befall him. And just as the Imamat of Isma‘il was handed over to him by the Command of God and His inspiration of the one who preceded him, so also was it handed over to his son by the Command of God and His inspiration, as is already narrated concerning how it happened in the past ages, and how the past prophets and Imams acted. Both we and you admit the tradition that when Isma‘il was about to die, he summoned his son [Muhammad b. Isma‘il] and his followers, and handed over the Imamat to him, in their presence, under the supervision of his father [Imam Ja‘far]. He entrusted the testimony concerning the position of his son to one of his hujjats [high ranking da‘i]… And Imam Ja‘far presided over the assembly, as [the Prophet] Jacob presided over the assembly of Joseph when the latter was on his deathbed. Then came Muhammad b. Isma‘il by the command of God and His Inspiration of him. His da ‘is dispersed, travelling in different provinces (jaza‘ir), and ordering the local people to carry on the da‘wah in his favour. The world became alive with da‘wah and his influence spread. These [the Isma‘ilis] hold that Isma‘il was the designated Imam after Ja‘far, as the sons of Ja‘far also agreed. They differ among themselves, however, as to whether or not he died during the lifetime of his father. Some of them say that he did not die, but that his father had declared that he had died to save him from the ‘Abbasid caliphs; and that he had held a funeral assembly to which Mansur’s governor in Medina was made a witness. Some, on the other hand, say that he really did die. Designation, however, cannot be withdrawn, and has the advantage that the Imamat remains in the descendants of the person designation, to the exclusion of others. Outcome #3: he did not designate another after having issued his previous designation of Ismāʿīl. Conclusion of Outcome #1: If the designation [of another son] was made and Ismāʿīl had a son, Jaʿfar would have issued a decision contrary to what God revealed should he have thereby given the inheritance of Ismāʿīl, despite his having a son, to his brothers without a cause for depriving the son… But to imagine something like that of Jaʿfar is inconceivable due to the validity of his imamate and his infallibility. If that is inconceivable, what is attributed to him concerning the designating of another of his sons, after having previously designated Ismāʿīl, is false. Conclusion of Outcome #2: If he were to have designated him and Ismāʿīl had no son, and yet [he had done so] with the knowledge and empowerment of God, there would have been a truncation of genealogical descent. But God’s knowledge and power would not have permitted a designation in favour of a person whose line would end, given that the Imamat is preserved in progeny. That requires that Jaʿfar did not designate Ismāʿīl. However, since we have found that he did designate him [Isma’il], we know that he was not without progeny and lineal succession. And if he was not without progeny and lineal succession, that the Imamat belonged to him and to his progeny is proven. Conclusion of Outcome #3: If, however, Jaʿfar did not designate anyone after having designated Ismāʿīl, the Imamat belonged to Ismāʿīl. If the Imamat of Ismāʿīl is established fact, that he had progeny is proven because the Imamat is not merited by someone who has no lineal successor since it is preserved through lineal succession. If his progeny is proven, that the Imamat belongs to his offspring is also proven. The situation was confined to these three possibilities and yet the three possibilities all require that the Imamat belong to Ismāʿīl and to his descendants. Thus, the Imamat is proven to have been Ismāʿīl’s and his son’s. Therefore, the Imamat resided in Ismāʿīl and in his descendants. Argument #2: We hold that since the Imamat resided in the succession of Jaʿfar, the imam would not have designated anyone he regarded as suitable other than a person he knew to be appropriate for it. The first thing to be considered fitting of an Imam in regard to his having the Imamat is that the person not be infertile. Next, since a person without a successor does not merit the Imamat, he should have a lineal successor and progeny. Because the imam Jaʿfar designated Ismāʿīl, from that fact we determine that Ismāʿīl had a son and successor; otherwise he would not have designated him. Since he had a successor, his successor was more worthy of the imamate than his uncles. Therefore, the Imamat belonged to Ismāʿīl, and to his successor, to the exclusion of the rest of them. Argument #3: “Given that the Imam is infallible, never having made a mistake, and given that, if Ismāʿīl had not had a son nor successor nor descendants, it would make Jaʿfar’s designation of him a mistake, since he was designated, with respect to the infallibility of the Imam, that requires that Ismāʿīl had a successor and descendants. If he had descendants and a successor, his successor is more deserving of the Imamat than his uncles. Therefore, the Imamat after Ismāʿīl belonged to his son, and to his descendants, to the exclusion of everyone else. Jabal Mashad in Masyaf, Syria. Jabal Mashad is believed to hold the tombs of Imam Muhammad ibn Isma’il and the three Isma’ili Imams who succeeded him : Imam ‘Abdullah ibn Muhammad al-Radi [Imam Wafi Ahmad], Imam Ahmad ibn ‘Abdullah al-Wafi [Imam Taqi Muhammad], and Imam al-Husayn ibn Ahmad al-Taqi [Imam Radi al-Din ‘Abdullah]. 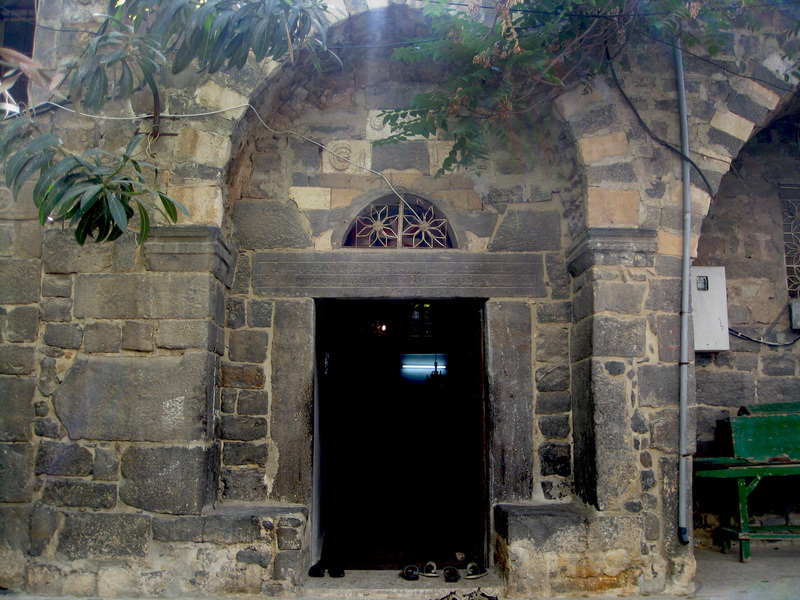 Inside Jabal Mashad in Masyaf, Syria. Jabal Mashad is believed to hold the tombs of Imam Muhammad ibn Isma’il and the three Isma’ili Imams who succeeded him : Imam ‘Abdullah ibn Muhammad al-Radi [Imam Wafi Ahmad], Imam Ahmad ibn ‘Abdullah al-Wafi [Imam Taqi Muhammad], and Imam al-Husayn ibn Ahmad al-Taqi [Imam Radi al-Din ‘Abdullah]. 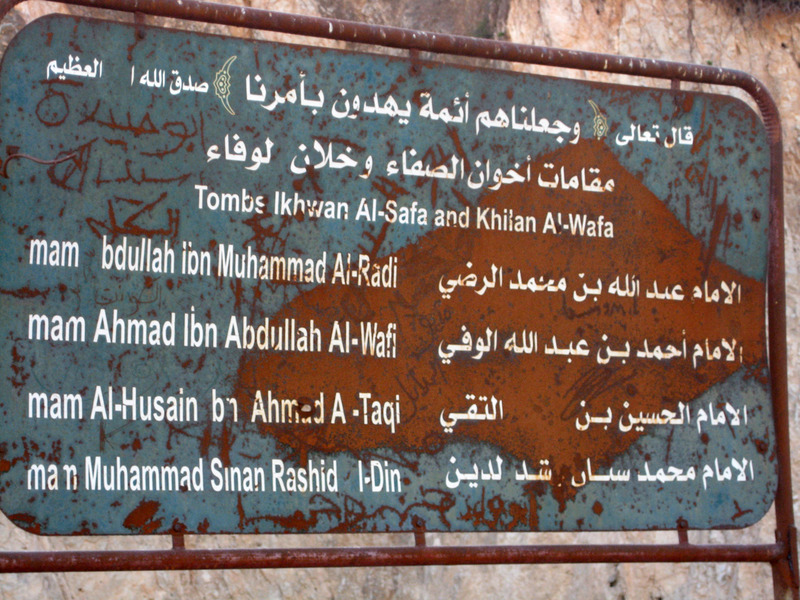 Sign outside Jabal Mashad in Masyaf, Syria. Jabal Mashad is believed to hold the tombs of Imam Muhammad ibn Isma’il and the three Isma’ili Imams who succeeded him : Imam ‘Abdullah ibn Muhammad al-Radi [Imam Wafi Ahmad], Imam Ahmad ibn ‘Abdullah al-Wafi [Imam Taqi Muhammad], and Imam al-Husayn ibn Ahmad al-Taqi [Imam Radi al-Din ‘Abdullah]. The first line of the sign reads: ‘God, the Exalted said: “We made them Imams guiding by Our Command” [Qur’an: 21:73 & 32:24], God speaks the truth.’ The second line is translated below it. The main proof for the Twelver line of Imams has always been the large number of Sunni narrations prophesising the coming of twelve Imams (these hadiths where the Prophet purportedly says that twelve commanders or khalifs will come after him). In Shaykh as-Saduq’s Kamal ad-Din, he continually argues against the Ismailis and Zaydis and other Shi’a sects on the basis of the “Twelve Imam” narrations. However, the pre-Occultation Twelver Shi’a hadith books have a striking lack of narrations about “Twelve Imams.” The two main, surviving works of Twelver Shi’ism which pre-date the Occultation of the Twelfth Imam of the Twelvers are the Basa’ir al-Darajat of Al-Qummi and the Kitab al-Mahasin of al-Barqi. The former book is an extensive tract on the fada’il (noble attributes) of the Imams; yet nowhere in it do we find a single reference to there only being Twelve Imams [there are only 5 scattered references to 12 muhaddathun in chapters not at all related to the number of Imams]. Kitab al-Mahasin is a text mainly dealing with issues of akhlaq (ethics), but does contain an extensive introductory discussion on Imamat. Once again, one finds absolutely no reference to Twelve Imams in this text, even in the chapter on the significance of the number 12. ان منا بعد الرسول صم سبعة اوصياء ائمة مفترضة طاعتهم سابعهم القائم انشاء له ان الله عزيز حكيم يقدم ما يشاء ويؤخر ما يشاء وهو العزيز الحكيم ثم بعد القائم احد عشر مهديا من ولد الحسين فقلت من السابع جعلني الله فداك امرك قلت ثلث مراة قال ثم بعدي امامكم ثم قائمكم. Imam as-Sadiq said: Indeed, after the Prophet there will be seven inheritors, Imams, upon whom obedience has been made obligatory. The seventh of them is the Qa’im, if Allah the Mighty and Wise wills he will come soon, and if He wills he will come later, and He is the Mighty and Wise. Then, after the Qa’im there will be eleven Mahdis from the progeny of Husayn.” His companion said to him: “May my soul be your sacrifice! Tell me who this Seventh Imam will be? He said this three times. Finally, Imam as-Sadiq said “After me will be your Imam, and then your Qa’im. The phrase khulafāʾ al-rāshidīn al-mahdiyyīn, ‘the rightly guided mahdī-ist caliphs’, was a part of the very first Fatimid khuṭba. [The Fatimid Imam-Caliph] Al-Qāʾim in 302 asked for God’s blessings on al-khulafāʾ al-rāshidīn al-mahdiyyīn. In [the Imam-Caliph] al-Manṣūr’s first khuṭba he uses the words ibn al-mahdiyyīn ‘son of the mahdīs’ for his grandfather. Later in the same sermon he cites al-hudāt al-mahdiyyīn, ‘the rightly guided guides’. In a subsequent khuṭba he speaks of [the Imam-Caliph] al-Mahdī as wārith faḍl al-aʾimma al-mahdiyyīn min ābāʾihi al-khulafāʾ al-rāshidīn, ‘the inheritor of the excellence of the mahdī-ist imams from his forefathers, the rightly guided caliphs’. In the sense of mubīn, the Imam is manifest and speaking in two forms: corporeal and luminous. That is, he is manifest both in human form and in the luminous form. Similarly, he speaks in both the physical hudūd as well as in the spiritual hudūd. The nobility of the Imamat and the crown of designation and appointment require, if it were to have been in any one of them [non-Isma‘ili lineages], that the authority of the Imamat continue in the lineal succession of the one who had a lineal successor. If that succession breaks off for them, while at the same time the existence of the Imamat in the lineal succession of Jaʿfar is well established, its authority rests with the lineal succession of Ismāʿīl, and it is thus correct that the Imamat belonged to Ismāʿīl and to his lineal succession. Therefore, the Imamat belongs to Ismāʿīl and to his lineal descendants to the exclusion of the rest of them. To learn more about the succession of Isma’ili Imams, from Imam ‘Ali ibn Abi Talib to the present Imam, Imam Shah Karim al-Husayni, please read our article, Light upon Light: Glimpses into the Succession of the Shia Ismaili Imams. Contemporary historians and scholars have confirmed the present Aga Khan’s claim to be the direct descendant of Imam ‘Ali ibn Abi Talib through Mawlana Isma’il ibn Ja’far al-Sadiq. His Highness the Honourable Sir Sultan Muhammad Shah, is held in the highest esteem by all sections of the Persian and the Indian communities. Through not a ruling prince he is a descendant of the ruling princes of Central Asia in the Middle Ages. He is, as it were, an uncrowned prince among the noblemen of India. His ancestry for forty-eight generations is traced, through the Fatimite Caliphs of Egypt, to Isma‘il, the son of Ja‘far al-Sadiq, the sixth Imam and through him back to Ali, the cousin and son-in-law of the Apostle of God. He is thus an hereditary Imam by a long descent. The Aga Khan comes from the stock of the Banu-Fatimid Caliphs, for he traces his descent through [Hasan]‘ala-dhikrihi al-salaam, who was a direct lineal descendant from Isma‘il, the seventh Imam, through Nizar, a son of Mustansir (one of the Fatimid-Caliphs of Egypt). The Aga’s ancient and splendid pedigree was accepted by Shah Fateh Ali Shah, for otherwise he would not have given the hand of his daughter and a government to Sir Sultan Muhammad Shah’s grandfather, who was then a mere youth. There are few persons throughout the wide world who do not know of the Aga Khan’s historic nobility and pontific heritage. All the same, a short account of his family would interest millions of Muslims and non-Muslims. The Aga Khans are direct descendants of the great Arabian Prophet through his son-in-law and cousin, the chivalrous Ali; and his beloved daughter Fatima. We have traced the line of the Imams of the Shia Imami Ismailis, known also as the Nizari branch of Ismailis, from Ali to the present Agha Khan, and we have seen the sect establish itself in India as one of the important components of Islam in that country. Most recently, Imam Shah Karim al-Husayni declared, at the 2005 Amman Conference, that he was the forty-ninth hereditary Imam in direct lineal descent from the Prophet Muhammad. His letter was read to the leadership and representatives of the Sunni, Twelver, Zaydi, and Ibadi madhahibs of Islam. It is worth noting that the Amman Conference was attended by the representatives of the highest religious authorities of Sunni and Shi’i communities including the Shaykh al-Azhar, the Ayatullah Ali Sistani, the Ayatullah Khamenei, and the Grand Muftis of several nations, and not one person disputed or challenged the Aga Khan’s direct lineal descent from the Prophet Muhammad. In fact, the Aga Khan’s lineal descent is affirmed and acknowledged during his visits to several Muslim countries including Syria, Egypt, Dubai, Russia, Pakistan, India, Bangladesh, Malaysia, Afghanistan, and many others who collectively constitute the vast majority of the Muslim peoples in the world today. Acknowledgements: Ismaili Gnosis would like to thank Shaykh Seth ‘Abd al-Hakeem Carney (1979 – 2007) whose book The Proofs for the Imamah of Mawlana Isma‘il ibn Ja‘far (2004, unpublished) served as the basis for this article, and Mohib Ebrahim for his tireless editorial assistance. Thanks for posting this article it is very informative and comprehensive, one most important and unique feature of this article is every argument is backed with evidence and reference. looking forward for more of these kinds. With all due respect, I disagree with this. According to our 49th Imam, Hazir Imam, the position of Imam is a lifetime position. So long as Imam Jafar Al-Sadiq was alive, he would have been the Imam. It is only at his passing does the Nass transfers to the next imam. If it had transferred to Imam Isma’il while he was alive, it would mean there were two Imams and that has not happened in our history. If we accept this, then it means that Imam Isma’il must have gone into hiding and became the Imam after Imam Jafar al’Sadiq passed away. My other question is why hasn’t someone reached out to Hazir Imam as to what happened to Imam Isma’il because really, he is the reason we are known as Ismailis. Every Imam is BORN with the Nur of Imamat. What transfers to the next Imam upon death is the formal authority. Thus, when one Imam makes Nass for the next Imam – he is merely REVEALING to the people who the next Imam is. From a spiritual point of view, the next Imam is already born an Imam. This applies to Imam Jafar, Imam Ismail, and Imam Muhammad b. Ismail. All 3 are born as Imams and Imam Ja’far’s appointment of Ismail simply reveals or indicates that Ismail is the Imam. And Ismail’s appointment of Muhammad is another indicator. So if Ismail even dies before Imam Jafar, his son Muhammad b. Ismail is still the bearer of the Nur of Imamat. Since every Imam is bearer of the Nur of Imamat at birth. Thank you for your response, I sincerely appreciate the information that you have provided, especially about the 4 Imams that were alive at one time. I have been searching for information on our history and your site is truly one of the best available. I’m looking forward to going through all of your articles. One of the things that this question of rightful successor brings up is what does it say about some of the children of the Imam? Why would someone that has these traits claim the Imammat for himself when he knows he wasn’t the rightful heir and the thing is that we see this in other areas of Shia Islam where Shia subdivide into other sects. Well the children of the Imam are nothing special. Only the child who is the Imam is infallible. As for Musa Kazim, he had political pretensions. It’s a fact that Musa Kazim himself participated in at least two anti Abbasid uprisings and this is why he was arrested and jailed. Later Twelver writings of course want to show him as pious and passive, but this isn’t the whole story. Furthermore many of the claimants to Imamat in this time like Nafs Zakiyya and Abbasids gave a lot to charity and outwardly showed piety. @Ismaili Gnostic I’ve been thinking about your comment from April 1st about only the Imam being infallible. Would you have any knowledge about Hasan ibn Ali, Imam Ali’s son? 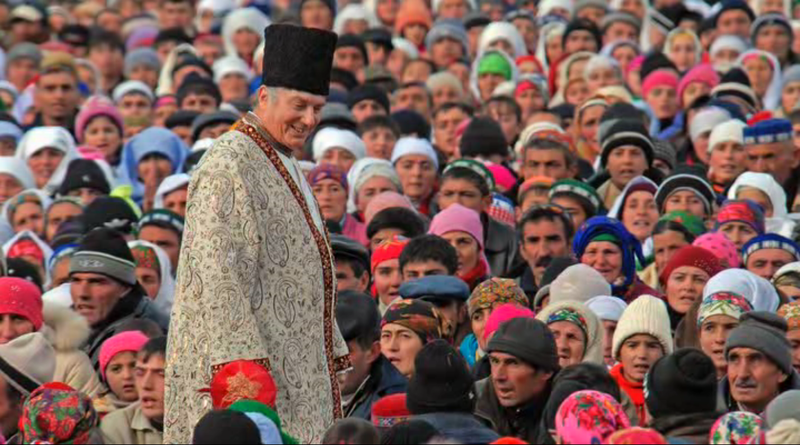 The Twelver’s consider him as an Imam, but Ismaili’s do not. I know you said that with the exception of the next Imam, the Imam’s other children are not infallible and could have personal aspirations. Do you think that was the case with Hasan ibn Ali when he became the second Imam of the Twelvers? The reason that I ask this is because Ismailis hold him in high status. We recognize him as a member of Ahl al-Bayt and we also acknowledge him in the sixth part of our Dua. Al-Hasan b. Ali is an Imam in Ismaili theology. He is a Mustawda Imam or Trustee Imam. That is a kind of Imam who holds the Imamat in trust and who cannot transmit the Imamat to his progeny. Meanwhile the Mustaqarr or Permanent Imam is the Imam who is part of the hereditary line in which the Imamat always remains. There have been other Trustee Imam’s before Al-Hasan and after him. When there is a Trustee Imam, he occupies the front of the state and the Permanent Imam remains silent. The Trustee assumes the Imamat functions on behalf of the Permanent Imam during these periods. This is very interesting, I’ve never heard of this before. Why would Imam Hussein need a Trustee Imam? Was it because the life of the Permanent Imam was in danger, although our Imams have been persecuted throughout history, so this would not be something new. You also mentioned there have been other Trustee Imams, would you have some more examples that I can read about? It is not only when an Imam in danger. Other socio political circumstances require a trustee Imam. For example sometimes when the hereditary Imam is very young, there will be a trustee Imam – his brother or cousin or uncle even. This happened with Imam Al-Mahdi whose uncle Muhammad bin Ahmad was a trustee Imam when his father died. In the case of Hasan and Husayn, the socio political Arabian customs at that time recognized Hasan as the head of the family as he was the eldest son. But Husayn was the hereditary Imam and that’s why Imamat continued in his lineage and not al-Hasan’s. Since the Imam is infallible, is it safe to assume that even if the hereditary Imam is still a child, he will be making the decisions in the background which are then revealed by the Trustee Imam who may be older and hence looked upon by the community as being more in a position to make leadership decisions? Hi Arif, if i m not wrong, I’m very much and well remembered you when we had a lenghty talks on your YouTube blogs in 2010 and 2011. Reconciliation of thoughts are most welcome but infirmed minds and positions not bear fruits. Why I said this as you already lied here that you are an Ismaili as much as I had an information that you already left your Ismaili position and accepted Ishnasharies. I m sorry if you are not the one and the same in mind frame whom I had an experience earlier. Alhamdulillah, you did a great job. Very informative.